Have you been searching for a great gift for that special artist in your life? 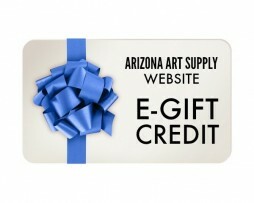 Then an Arizona Art Supply Website Gift Credit is a great option for any artist, any where! During Checkout, please select Gift Store Credit to Someone Else and enter their email address and a message. Please note: the Website Gift Credit is for website purchases only, and cannot be used at physical retail locations.